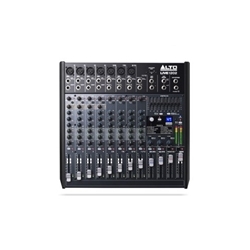 Offered as a high-fidelity 12-channel, 2-bus mixer, the Live 1202 by Alto combines DSP effects with USB connectivity to provide flexible options when mixing live sound in clubs, bars, houses of worship, theaters, or for special events. Featuring seven microphone channels with low-noise DNA preamps, four channels of analog compression, and 3-band EQs on each channel, this mixer delivers a clean signal path with high headroom and full dynamic range. The two Aux sends on each channel allow you to create monitor mixes or send the signal to the effect processor. The 9-band graphic EQ helps you adjust the sound of your Main or Monitor mix to compensate for the acoustics of the venue. A headphone output with independent level control adds to the versatility of this mixer. For even more creative control, you can select from 100 Alesis DSP effects, including reverbs, delays, flangers, choruses, and more. The bi-directional built-in USB sound card allows you to capture a live recording to a Mac or Windows computer, straight out of the Main or Sub Mix 1/2. You can also play back sound files stored on your computer. The 60mm faders with mute switches and LED metering provide precise control and visual feedback for hands-on mixing, while the color-coded sections and knobs help you identify and quickly reach for controls in dimly lit environments. For added convenience, the USB port powers lamps or charges mobile devices.